Amazon Price: $135.00 (as of October 18, 2017 12:13 am - Details). Product prices and availability are accurate as of the date/time indicated and are subject to change. Any price and availability information displayed on the Amazon site at the time of purchase will apply to the purchase of this product. Timeless classics for everyday wear. 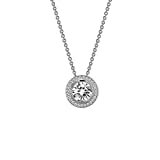 This pendant is set with Lafonn's signature cubic zirconia in sterling silver bonded with platinum. The pendant comes on an adjustable 18" chain.